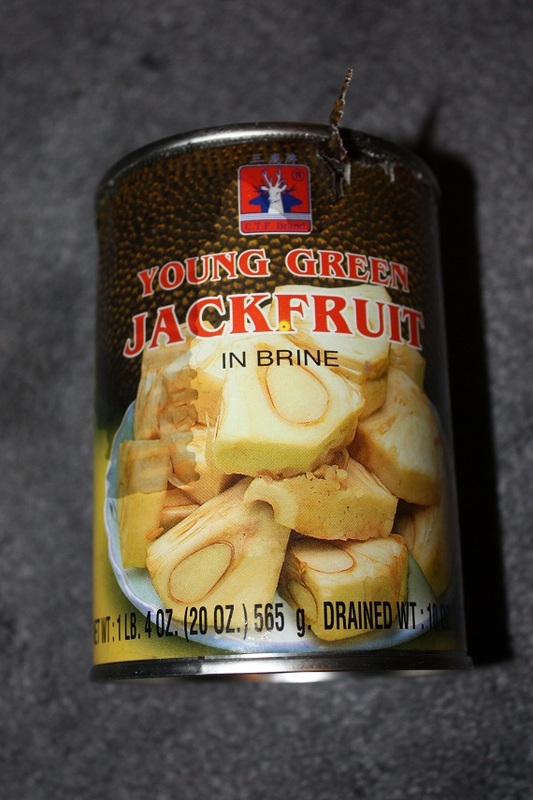 To continue with posts on food I don’t usually eat, but have had so far this week… today’s post is about jackfruit or katahar (कटहर) in Nepali, and also happened to have been my dinner last night. 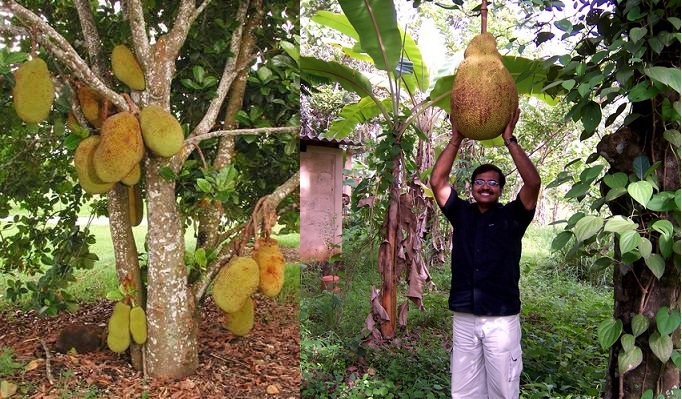 According to wikipedia, jackfruit is the “largest tree borne fruit in the world, reaching 80 pounds (36 kg) in weight and up to 36 inches (90 cm) long and 20 inches (50 cm) in diameter.” It’s also the national fruit of Bangladesh! 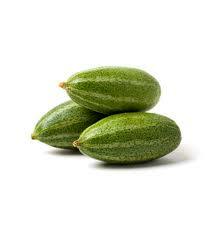 They are massive yellowish-green fruits with a thick bumpy outer skin, almost spiky but too dull to poke you. While visiting a friend’s village in the Terai region of Nepal in 2009 we stacked the back of the car with large jackfruits to bring back to his family in Kathmandu, but it wasn’t until last night that I actually tried one. The fruit is sometimes referred to as “vegetarian chicken” or as D poetically put it last night, “chicken’s younger brother” (while AS said, “shhh… don’t say that or C won’t eat it!”). It gets this reputation by how “meat-like” the vegetable can be, especially after cooking. I’ve never been big on fake meat, mostly because I was never a big fan of the taste and texture of real meat, and thus lack that “meat nostalgia” some vegetarians struggle with. Sure I’ll eat veggie burgers (most don’t look or taste much like meat burgers anyway), and on very very rare occasions I might try some veggie sausage for breakfast, but that is about the extent of it. So eating a fruit that has the look and texture of meat was kind of strange and a bit unnerving. 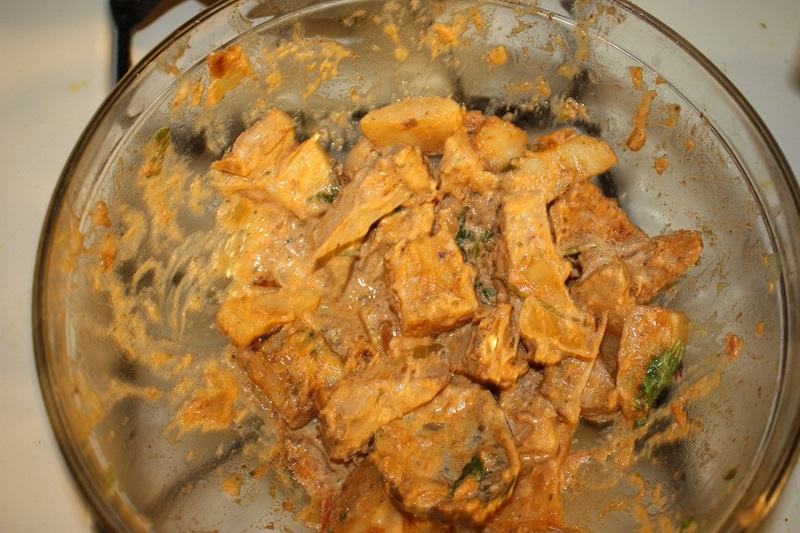 jackfruit curry, left overs after dinner was finished. 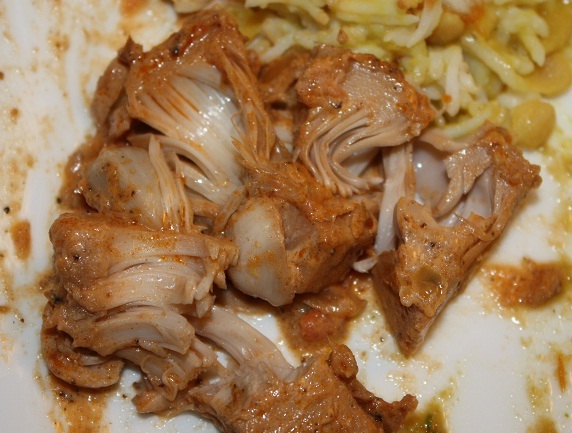 Can you believe this is a *vegetable*?--jackfruit on my dinner plate... when you pull the individual pieces of jackfruit apart the pieces pull apart just like real meat. I swear this almost looks like pulled pork! 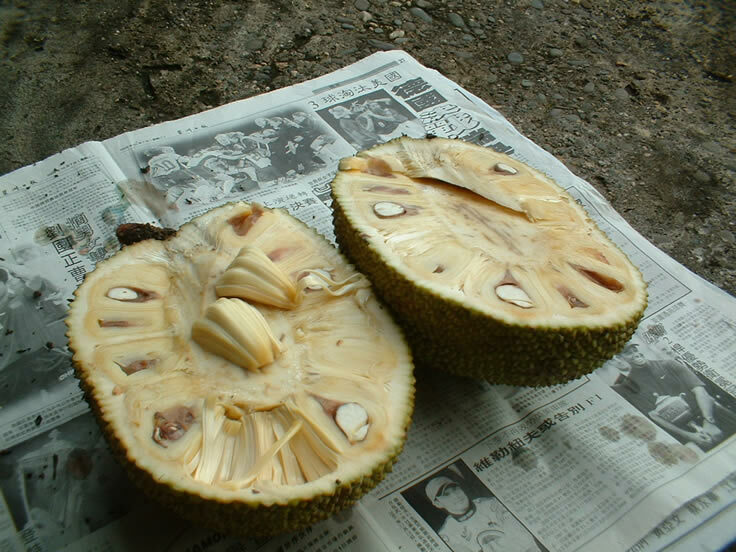 The fruit also has small "eyes" in it that look similar to meat fat or bone sockets. The taste was fine, but it took me a bit to get over the texture. Final analysis: would I eat it again? Sure. Is it my favorite? No. There are lots of other “kinda like meat” Nepali foods that I would rate much higher… like masura or titora, even nutri-(soya) nuggets. We also ate fried parbar as well. Unfortunately no one at the dinner table knew what “parbar” was in English, and I can’t find it online. Found in Indian grocery stores, it is a small oblong shaped green vegetable that can be sliced into quarters, the seeds removed, and fried with spices to make a snack. I should have taken a picture, but since we had 10 people for dinner, and I was already whipping out the camera for the jackfruit, I didn’t want to go overboard. If anyone knows what the English name is, please let me know! Yes! It was “pointed gourd!”According to wikipedia it is sometimes colloquially called “green potato” in South Asia… which makes sense, because once it was fried, I told AS it tasted a little like a spiced french fry with a peel. they might look like cucumbers but they are different on the inside. I’ve mentioned my vegetarianism before. I’m not a veggie proselytizer, I’m not out to recruit people, and you won’t see me chaining myself to a slaughterhouse door, but my own vegetarianism is important to me. The more I hear about the factory farming process in documentaries like Food, Inc, and when I read about potential health issues from some types of meat consumption, it makes me feel more confident in my dietary choices. I’ve also mentioned before that P is an avowed chicken lover. Of course, I’d be happy (and probably his veggie mother would too) to have him phase meat out of his diet, but I also don’t expect him to give up something he truly, honestly loves. P has toyed with the idea of making the switch, but I don’t think it will ever happen. I’ve been told on many occasions that my veg momos don’t hold a candle to the chicken or pork momos my other friends voraciously consume, and I can see the excited glint in P’s eye when there is a nice goat curry or a packet of deer jerky around. So that brings us to the discussion of how to raise children when and if we have some one day. I’ve already made my feelings on the subject known. I’d very much prefer to raise vegetarian kids, and once they are older (middle school/high school aged) they can decide for themselves, and I’ll happily live with their decision. P, on the other hand, though less vocal, has stated that he would prefer to raise kids that enjoyed chicken momo, etc. There isn’t a whole lot that P and I don’t agree on, but this is one. Other friends have weighed in on the argument—“If you raise them veg, then they will probably not like meat anyway… you’ll be influencing them from the start! That’s not fair to them!” but I kind of feel the same way, if you start them off eating meat, what if they never think about life without meat? Or what if they decide later in life to be veg and they are uncomfortable with having grown up eating meat and they question me as their parent for not sticking up for them? What if they are angry that I denied them the pleasure of meat as a child? Since my own vegetarianism is so important to me, how can I morally let them eat meat when they are too young to make the decision for themselves? That is what intrigued me so much about Foer’s book. I’m very keen to see what conclusion he comes to. It’s been quite interesting thus far, even though I’ve only just started. Wow, food for thought (no pun intended). I’ll have to let you know what I think once I finish the book. I was sitting in my office during my lunch hour, munching on some leftovers, trying to think of something to write about, when I got an email from S. He and R live a few hours drive away from us, on a main route that P and I take all the time to visit relatives or other friends. They have become a major pit-stop on any road trip that we take, and now it is hard to drive that stretch of road and not stop, even if just for a cup of tea! Anyway, they know that we are staying at their place tonight so S said, “I figured we would make momo in honor of your blog” yesss! Yet I have already written about momos, so I figured I would expand on the topic of food. Green Dot- no worries for me! I feel really lucky. South Asian food, in general, is delicious, not to mention there are a lot of vegetarian dishes for me to choose from. When I studied in India it was incredibly liberating to walk into most restaurants in Delhi or Jaipur and see half a menu of vegetarian options, or entire restaurants where I could close my eyes and pick something at random off the menu and know with complete confidence that it was veg. I was a huge fan of Indian packaging with the “green dots” for veg food and “brown dots” for non-veg. I didn’t have to read labels or second guess. It was wonderful, and very depressing when I came home to the States and ate at a restaurant only to find I had two choices on the menu. I sometimes joke with P that if I had fallen for a Korean, a Kenyan, or a Brazilian, I would have been in deep trouble since fish and meat are central to a lot of these communities’ favorite dishes. Yet South Asian food has a lot of variety, of both meat and vegetables, and it is easy for me to find something that I like. Don’t get me wrong, I think P might just die if he gave up chicken, but if we eat daal/bhat (lentils and rice) with saag (cooked spiced spinach), mushroom curry, or chana masala (chickpea curry), he is a pretty happy man. Learning to cook Nepali food has actually opened up my own interest and experimentation with cooking in general. Now, if you come to our house for dinner (as many often do) it’s possible that you might have mushroom/spinach/gorgonzola pizza or that you might have daal, bhat and egg curry. I’ve come quite a long way from my culinary roots. I gave up eating meat in stages in late middle/early high school. I was never a big fan of the taste. I had different philosophical, emotional, and personal reasons for not wanting to eat meat over the years, but now it boils down to time. It’s been a really long time since I’ve eaten meat—I’m in the double digits of years now—and I’ve lost an appetite for it, I just don’t find it appealing. "Don't make me eat it! I'll just take the peas!" My family is at peace, for the most part, with my decision now (although I still get the “don’t forget to pass C the turkey!” jokes on Thanksgiving). Yet when I was a kid first exerting my interest in vegetarianism, it was a tough uphill battle. I spent many nights sitting alone as punishment at the dining room table long after everyone finished dinner because I refused to pick up my hotdog and eat it. My parents, especially my meat loving dad, just didn’t get it. For him cooking meat was like a work of art—you grill it and spice it to perfection, you slow roast it to fill the house with its titillating aroma, you savor a good cut, and you don’t overcook it so that you can still taste the deep natural flavor of the meat. I think he enjoyed the process of meat eating as well. He loves to hunt and fish, and I think he felt a connection to the venison burgers he made, knowing that he had been an important part of the entire consumption process. As a kid I was appalled by this, but now I have a lot of respect for his way of thinking. I like that he is a sportsman who uses every part of the deer. He stocks his freezer with cuts of caribou and antelope, and slowly eats it throughout the year, gifting the meat to friends and family along the way. However when I was young this did not help me in diversifying my culinary choices. We were a real “meat and potatoes” family, and every dinner consisted of a meat, a starch (mashed potato, baked potato, pasta, rice), and a boiled vegetable (corn, peas, carrots, broccoli, asparagus). Sometimes we had a salad as well. When I gave up meat I simply removed it from the equation. I’d have mashed potatoes and corn, or pasta alfredo with broccoli, or just a big salad. I wasn’t paying attention to proteins and I wasn’t really exploring other options, but at the time, especially after throwing veggie burgers into the mix, I was satisfied enough. My repertoire of dishes might not have grown much beyond mixing pasta and lentils with “Italian seasoning” and olive oil had I not started hanging out with the Nepali gang. A whole new range of spices opened up to me- cumin (one of my favorites! ), turmeric, garam masala, red chili and paprika, fenugreek, cilantro, different curry powders, even using garlic and onions like I never had before. Once I had a steady foundation of daals, and veg curries, I started getting creative with salads, soups and casseroles. When we moved, some of the Nepali women I met asked me how to make American bake goods. My paternal grandmother had been famous for her pies, but other than Betty Crocker cake-in-a-box, I’d never really made my own homemade stuff before. Feeling like a cultural liaison (never wanting to miss an opportunity for east meets west) I asked my grandmother for some of her recipes, and started making cookies and pies so that I could show my new friends how to make these desserts. It was great. Nepali cooking gave me the confidence to cook South Asian, as well as American. I don’t profess to be a great cook, and I don’t cook everyday (ask P, he will tell you!) but I enjoy the smorgasbord of food we now eat. We make a lot more from scratch (realizing that it’s cheaper and doesn’t take forever to make homemade pizza dough or waffle mix, and it tastes so much better!) and we can eat a greater variety of food. Yum! I’m starting to get hungry for those momos!